I used my free zeta for her. I rather get it back now. Nest didn't get nerfed, it's just the Revan now properly interacts with her. This is like asking for a refund on Zaul because they released R2D2 and Zaul's "evasion got nerfed!" It's WAI. Bonus protection is based off max health. ahh I see. That makes sense. You know Nest is still good vs everything not named Revan right? I'm not a dev, but I can read the lines Nest's ability that have been the same since she was released. It just says gain bonus protection. It's vague. Doesn't say max health or current health. I always thought it was based on her max protection. 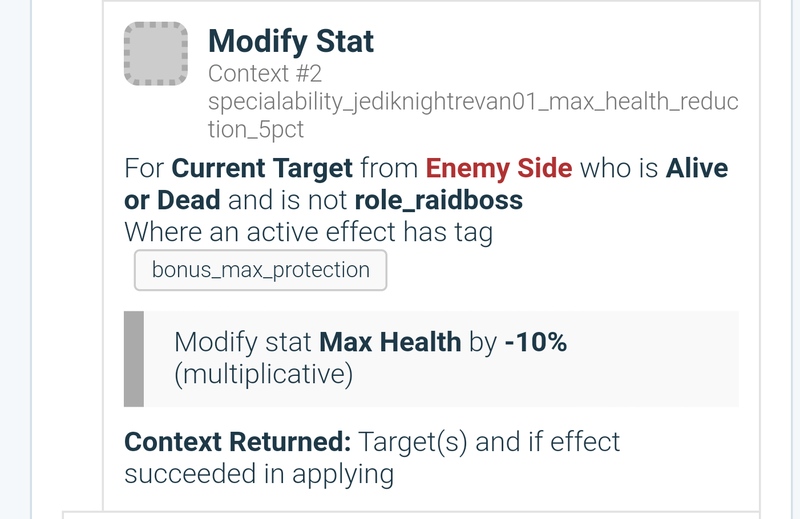 Edit: the in game mod suggestion is to mod her with more protection and crit damage. If her bonus protection is based on her health that should be stated in game too. It's all too vague. Based on Revan's leadership coding it is WAI. When he swarms Nest and she's gaining Bonus Protection, every basic hit by a Jedi that triggers a protection increase is also triggering a -10% reduction in her max health, stacking. Unfortunate for everyone else, of course. The "Three Year Anniversary" gift is what the OP is referring to. no because the 10% decrease in max health can be resisted hence the high tenacity nests in arena. Also depends on the definition of max health for the protection up. was starting and seems to have been changed to current max health. You starred, geared, and zetad Nest to counter Revan? The same Revan whos kit is specifically designed to break Nest? And has been since he was released? I'm sorry. I built Nest as soon as she was farmable, and while I'm sad that Revan is a hard counter, I don't regret the investment at all. You what? Revan was clearly designed to remove traya from the meta. Sorry but i thank Her zeta from Max based hp. I'm too put zeta on her and not happy. Why couse most enemies from top is revan. Even gear her from 11 to 12 its pain in ****. 150 stun guns? Revan's kit wasn't designed for Traya OR Nest. It was designed to have elements to counter pretty much every composition under the sun. It's not a complete hard counter to one particular group, but has elements to make any faction have a harder time defeating him. Revan is not a hard counter to Nest. Revan was specifically designed to be a hard counter to every other decent leader and unique ability in the game. That’s why his kit description reads like a doctoral dissertation because they had to include language that excluded 100+ characters from working well against him. How is Revan not a hard counter? His bit about reducing Max Health on toons under bonus protection goes directly against the one part of Nest's kit that makes her Nest - stacking bonus protection. Isn't that what a hard counter is? Except that Qi'ra lead, Nest, and Hyoda could auto revan teams before by making Nest have a ton of protection and tenacity so that she could regain that protection and the revan team would just get counter attacked to death by the unkillable nest. But in order for that to work Nest needs to gain bonus protection even after her healthpool is reduced otherwise she runs out of protection too fast and GMY just one shots her. I’m saying Revan is a hard counter to literally every character in the game. Not just Nest. Revan aside, my Nest just got smoked by raid Han and CLS. Nest never got a turn. Han double tapped her doing damage both times, then it was immediately his turn again due to TM and damaged her again. Then CLS went and killed her. She never even had a turn. Never seen that happen before. I'm actually cool with the fix (if that is what it is) but to do it with zero notice a day before GA is just mind blowing. I want my gear back. Very sly nerfing Nest during the C3PO hysteria. No longer stacking protection based on max health but rather current health. Where’s the zeta refund on her? I zetad her at 3 stars. CG doing the customers right again. Just so it’s clear it’s still stacking based on max health. Revan (and I thibk jango?) can lower max health, which will change the amount of bonus protection Nest is getting. The game now accounts for that change in Max health while it wasn’t doing so before. Bingo. Supposed to be based off of current max health not max health when you entered the battle. In a vice versa argument: that would be akin to Executioner NOT stacking offense based on his current max health and only what he entered battle with. He'd be useless but it would match what Nest was originally doing, which was wrong. 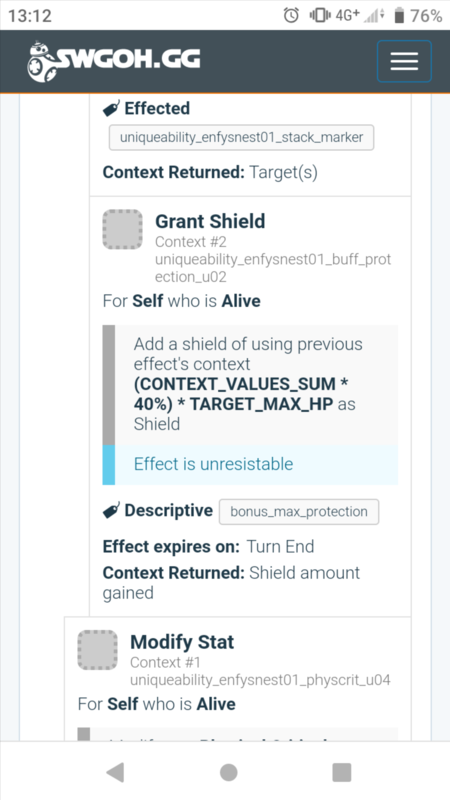 Players complained that Nest was broken/bugged for using his starting max health to make the bonus protection calculation. I bet those players are very happy that Nest's bonus protection now is more in-line with the expected performance (as per the skill description).